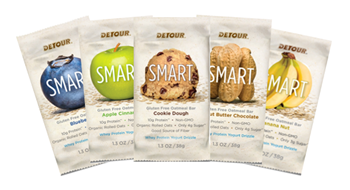 Detour delivers to your health-conscious consumers the nutritional advantages of whey protein with the appeal of a candy bar. Provide your customers with a great on-the-go alternative! 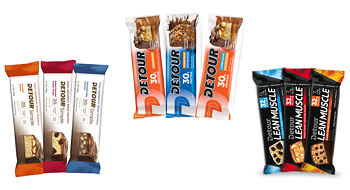 Detour bars begin with whey protein, the highest-quality protein available. This amazing ingredient contains all the essential amino acids for muscle recovery and repair along with a long list of other health benefits. And, then we focus on making the most delicious bars possible. The results are award-worthy! Detour Lean Muscle combines our award-winning protein heritage with the emerging benefits of essential nutrients like omega-3s. This is the next generation protein bar. First of its kind Omega-3 fortification featuring 1000mg+ of Omega-3’s plus 21 vitamins and minerals. The Original Detour bar offers a complete source of essential proteins with an award-winning candy bar taste. Detour Lower Sugar is the first to combine, whey protein, the right protein, with dramatically reduced sugar levels. With all of the body-shaping nutrition of the original but with amazingly low levels of sugar. Simple starts with REAL ingredients covered by a luxurious chocolate coating all while keeping low sugar, low calories and powerful whey protein making it a perfect snack! 20g of Protein, 8g Fiber, 4g Sugar, 220 Calories, Nothing Artificial, Gluten Free, Non-GMO! SMART Oatmeal Bar Whole grain oats, whey protein and clean ingredients make this the SMART choice from breakfast to late night treat! 10g Protein, 3g Fiber, 4g Sugar, 130 Calories, Nothing Artificial, Gluten Free, Non-GMO!